Check in regularly to stay up-todate with what's happening. Kumara waffles, a new range of Christmas chocolates, tiny stand'n stuff tortillas, a different fresh potato product, Kit Kat dark and an entirely new summer cider/wine combination are about to be introduced to Kiwi taste buds soon. Countdown's commercial food expo in Auckland yesterday revealed products not yet for sale in New Zealand but those that will soon be tempting shoppers, bored with the same old baskets and trolleys full of goods. Managers and buyers from all 184 Countdowns throughout the country were sniffing, testing, tasting and viewing at the event where food suppliers, growers and manufacturers had products on stands in the main auditorium. Orange kumara waffles were being made by former MasterChef winner Brett McGregor. His recipe is available at the kumara promotion site kumara.co.nz - and although not a new product for sale, McGregor said using a nutrient-rich vegetable such as kumara was a healthy choice. He topped his sweet creations with fresh berries. Countdown wants to sell more kumara, so McGregor was working with major grower Kaipara Kumara. Red Kumara Getting Harvested NOW! The votes have been tallied and it seems kumara is the clear favourite to be named New Zealand’s National Vegetable, after securing more than 80% of the vote. Inspired by the #VoteBeetroot campaign launched earlier this year by LeaderBrand, one of New Zealand’s largest producers of fresh vegetables, kumara was a late entry into the race but managed to pip beetroot to the post. The #VoteBeetroot and #VoteKumara campaigns were run via an online petition with LeaderBrand gathering support for beetroot and Kaipara Kumara backing kumara. Consumers were asked to place their vote over a 6 week period that culminated at The Food Show held in Auckland from July 30 to August 2. The kumara petition will now be submitted to the New Zealand Government for consideration. For more information on the two contenders visit www.leaderbrand.co.nz and www.kumara.co.nz. 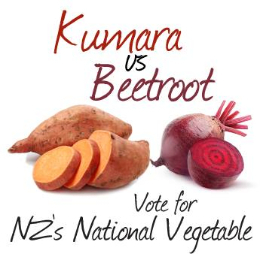 For more information on the National Vegetable campaign, visit the Facebook page www.facebook.com/pages/Kumara-vs-Beetroot. Founded in 1975 by Murray McPhail, LeaderBrand is recognised as one of New Zealand’s largest and most innovative horticultural and fresh food businesses. Still a family owned business, LeaderBrand prides itself on providing fresh produce of the highest quality. By overseeing all stages of production from site selection, soil preparation, planting, growing, harvesting, processing and distributing, LeaderBrand maintains full control of its products from “garden gate to dinner plate”, ensuring the best eating experience possible. With farms located in Canterbury, Gisborne and Auckland, LeaderBrand grows approximately 3,500ha of fresh produce each year for domestic and international customers. LeaderBrand grows Broccoli, Lettuce, Buttercup, Sweet Corn, Watermelons and a variety packaged Salads available from the fresh department of your local supermarket shelves. Kaipara Kumara began as a family business in 1970 focusing on mushroom cultivation in Ruawai, in the Far North. While kumara has overtaken mushrooms as the heart of the business, the company remains a family business with brothers Anthony and Peter Blundell now at the helm. The company has grown to one of New Zealand’s largest kumara pack houses, producing nearly 5,000 tonnes of kumara each year and employing 33 staff members. For more information, visit www.kumara.co.nz. Subscribe today to learn about the process of growing Kumara. Kumara Crowned King of New Zealand! Over the past few weeks, LeaderBrand, one of the country’s largest producers of fresh vegetables, has been lobbying for beetroot to be declared the National Vegetable of New Zealand. However, this week a new challenger has thrown their hat into the ring. Kaipara Kumara, based in Northland, is arguing that kumara should have the title. Both LeaderBrand and Kaipara Kumara have set up online petitions via Change.org where New Zealanders can get behind their chosen vegetable by leaving their signature. Anthony Blundell, Kaipara Kumara Managing Director, is not convinced. The battle of beetroot versus kumara will come to a head at The Food Show in Auckland from 30 July – 2 August where both LeaderBrand and Kaipara Kumara will be collecting signatures. Both petitions will then be presented to the New Zealand Government for consideration. New Zealanders can also show their support by using the hashtag #VoteBeetroot or #VoteKumara on Twitter and Instagram. Updates on the petition will be posted on a dedicated Kumara vs. Beetroot Facebook page. LeaderBrand and Kaipara Kumara will also be running a joint recipe competition through the Facebook page to help promote the campaign. Different categories will be available depending on the entrant’s choice of vegetable. Masterchef winner, Brett McGregor, will judge the competition after The Food Show.